Chicken is usually more expensive when boneless. Although it takes a little time and effort to debone chicken, the task may save you money. Remove the meat from chicken thighs, then cut the meat into small pieces to add it to a casserole or stir-fry dish. Place the chicken thighs onto the cutting board. 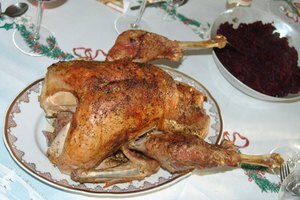 Separate the thighs from the drumsticks, if necessary, by inserting the tip of the knife into the joint between the two parts of the leg. Push the knife carefully into this joint to sever the cartilage. Set the knife down and twist the two pieces apart with your hands. Set each drumstick aside. Place a thigh onto the cutting board with the skin side down and the bone side up. Insert the tip of the knife into the flesh along the bone and cut carefully along the entire length of the bone to loosen it from the flesh. Reach into the incision with your fingers and hold the bone in your nondominant hand. While you hold the bone, work to loosen it from the thigh by cutting through the flesh still connected to the bone. Continue cutting and pulling until you can remove the entire bone from the thigh. Flip the thigh over and pull the skin off with your fingers. Cut the deboned thigh into 1-inch pieces and place the chicken pieces into the bowl. Repeat the same process with each chicken thigh. 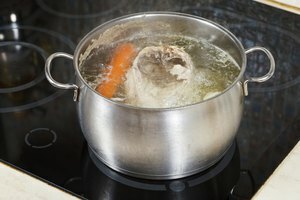 How do I Cook Bone-In Chicken in the Oven?